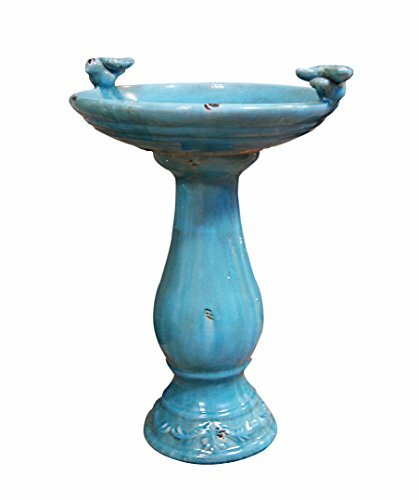 Welcome your feathered friends into your garden with this Turquoise Antique Ceramic Birdbath. 2 detailed birds molded into the ceramic adorn the rim of the basin to create a more welcoming environment. Perfect for your garden or near your favorite gathering spot, this birdbath brings timeless beauty to your outdoor space. Bring a beautiful and classic touch to your yard with the Antique Light Turquoise Ceramic Bird Bath. Handcrafted out of ceramic and finished in an antique light turquoise glaze, you'll love the way this bird bath takes you back to the Victorian age. Decorated with a bird perched on each side of the bowl, you'll enjoy watching colorful birds come to bathe and drink. Shallow basin allows easy access for all bird types! If you have any questions about this product by Alpine Corporation, contact us by completing and submitting the form below. If you are looking for a specif part number, please include it with your message. Looker Products 17 Hanging Classic Cedar Bird Bath with Removable Pan"